← Was that really real? 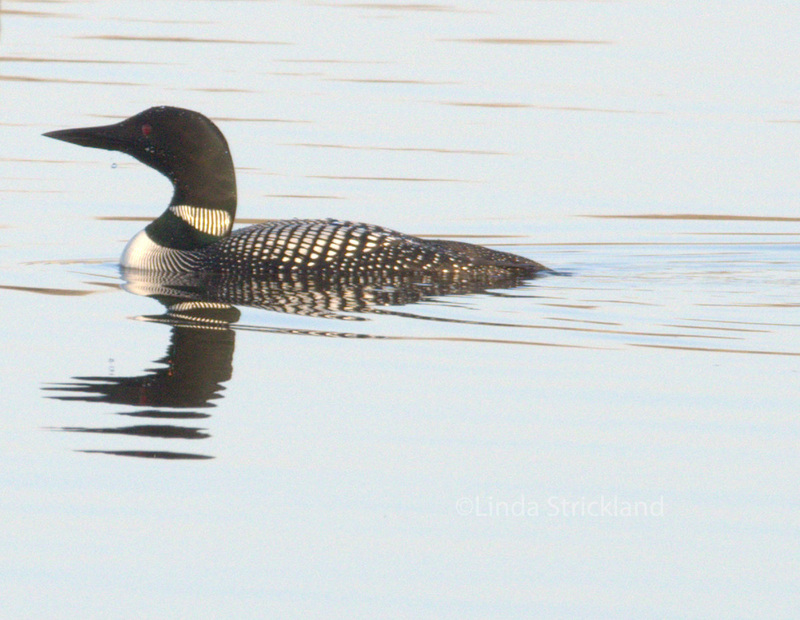 And here’s an awesome 2 minute video of loon calls. It gives me such comfort! I can’t explain why. Thank you so much Amy. These were all taken in 1 day. Spring is such a time of constant change. I love that beautiful pelican! 🙂 We used to have lots of them in Chennai. I miss them!! I like them too Line. 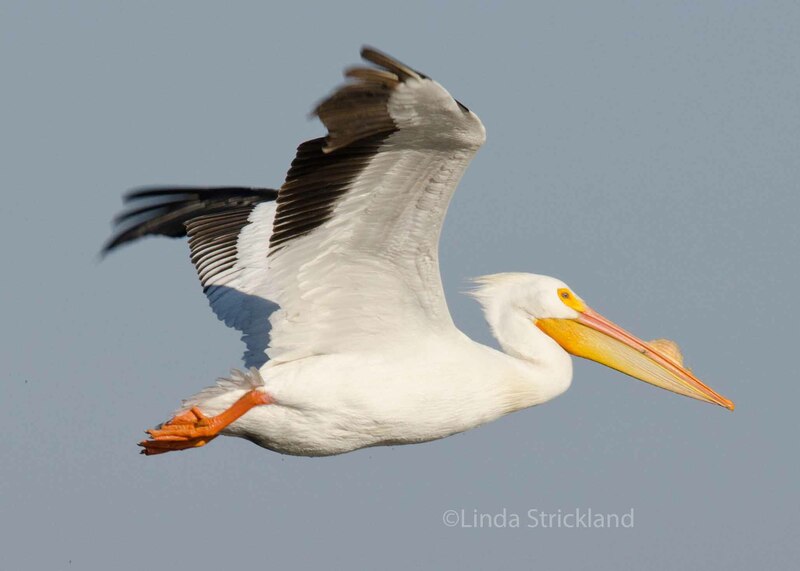 And apparently the pelicans had never been seen at that location prior to this year, so he got photographers from Denmark photographing him the day before! Thankfully we missed all that commotion. I think it’s cool to sometimes just put on a nature soundtrack (like from one if the rain forests), while going about whatever I might be into around the house. Thanx for sharing the photos and the loon track. I think so too loujenhaxmyor. I have a cd of dolphin sounds that really lifts my mood and makes me feel like anything is possible. Thanks for your visit. thank you Joshi. There sure are some wild looking ducks in the world! 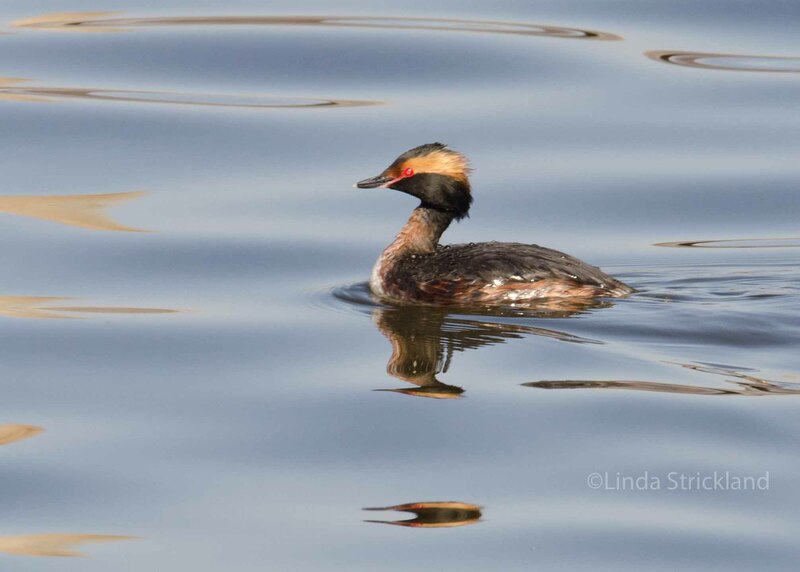 The horned grebe is my favorite too. He’s so colorful and kind of wild looking. The loon calls are so hauntingly penetrating to my soul. I love them. I think it’s because the sounds are so primordial and my soul resonates and recognizes it. Perhaps a call to come home. And I love that photo of a pelican. It’s just so cool! Thank you John. Yes there is something primordial about the loon call. And I also have a tape of dolphin calls, and that has the same effect on me. It just soothes me and brings me into another world, away from my cares and troubles. Tons of birds chirping happily here now. So uplifting! Thank you, dear Linda! Thank you Maryse! It certainly is. Even though today is a gray day, I saw some tree swallows creating a nest out of a bluebird box! Hoping the pictures turned out. I might post later. Yes I love it too! It’s strangely soothing to me, I’m not sure why. So much nicer than the irritating call of the canada goose, maybe I just hear them too often! hehe. I would love for you to share this. Isn’t it fabulous to see the birds returning? The geese are already hissing at me when I run. I don’t even mind I am so delighted with their signal of spring. Fabulous photos of their arrival. Thank you so much lavendermoon! I’m so glad that people are listening to the nature sounds. I’m going to do this more often. Took a walk with a birder friend a few weekends back–stepping off an all-you-can-eat buckwheat pancake brunch at a Maple Syrup Festival–he pointed out so many interesting birds I wouldn’t have otherwise noticed. Thanks for more. I sort of learn them as I go! Once I take a picture of them I look them up online and find out what they are. It’s always wonderful to see new and different ones. Linda, this was marvelous. Loons always remind me of when my husband and I first met. He was a park attendant at a small lake just outside of our hometown. Lac Le Jeune was enhanced by the beautiful loons. what a wonderful memory! My husband and I had our first date, listening to music, and our 2nd one cross country skiing. The outdoors has always been so important to us both. Glad that I could bring this memory back for you!